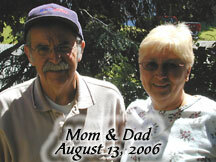 Today would have been my dad's 69th birthday. I hope wherever he is, he's happy. My heart breaks for you. I am now hitting the three year mark for my father's progressive disease. I am terrified about losing my father. He is all I have left. I did a search for Alzheimer's blogs and your popped up. I lost my Mom to it 4 years ago after taking care of her for 7 years. Help raise money for Alzheimer's Disease!